International student Maria Paula Gomez is pursuing a master’s degree in big data analytics at Florida Polytechnic University. She also completed an undergraduate degree in mechanical engineering since coming to the University from her native Argentina in the fall of 2016. Editor’s Note: This story is part of a series of feature stories highlighting female students and faculty as Florida Poly celebrates Women’s History Month. 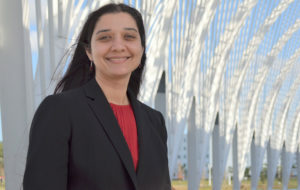 Florida Polytechnic University graduate student Maria Paula Gomez has been out of her comfort zone for a while, and that’s how she likes it. She left her loved ones behind in her native Argentina to take a leap of faith in herself for a better future. Gomez has family in Lakeland, Florida, and during one of her visits she found out that Florida Poly was accepting international students. She already had a bachelor’s degree in industrial engineering from the Saint Thomas Aquinas University in Tucumán, Argentina, but this was an opportunity she couldn’t miss. However, her English skills were a challenge. She decided to complement her industrial engineering degree with a bachelor’s in mechanical engineering to broaden her knowledge and skills. This brought her a different set of challenges from the very beginning. Gomez completed her new undergraduate degree in five semesters and was immediately ready for her next step: a master’s in big data analytics. She has a natural ability with numbers that’s proving useful in this new area of learning. And once again, she wasn’t scared of the new challenges. And while she continues to overcome every obstacle in her way, Gomez keeps her eyes on her future goals. She wants to gain some experience in data analytics before eventually having her own consulting company. After all, dreaming big has never been a challenge for Gomez. “I always follow my intuition. Some people will tell you it’s not possible, but if you put your time and effort there’s nothing you can’t do,” said Gomez.